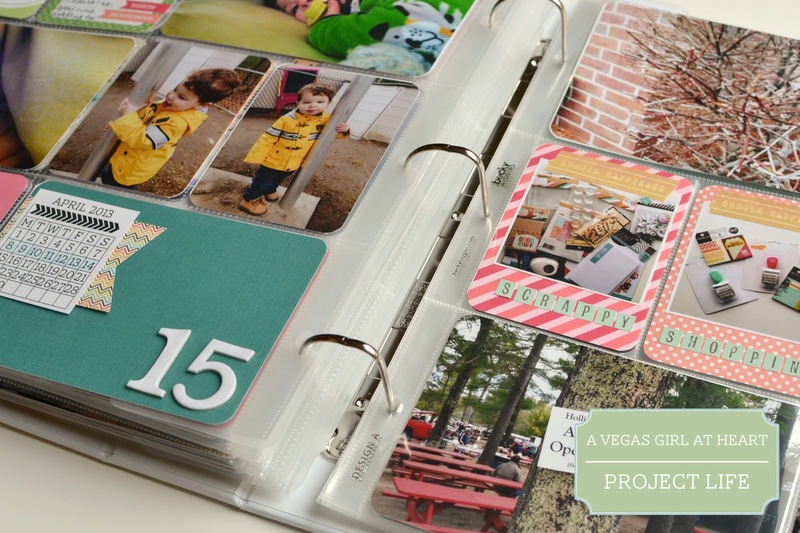 Welcome to Project Life 2013, week 15. If you're new to my blog, make sure you check out my post about my 2013 album. I am finding that I'm gradually falling back towards the not-so-simple layouts that I started the year with. 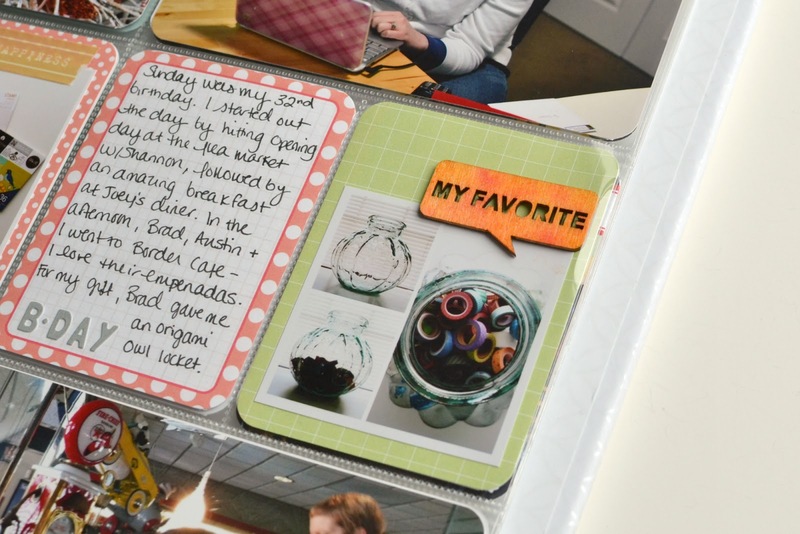 I have an overwhelming desire to be creative lately, so I've been adding a few more extras to my Project Life spreads. 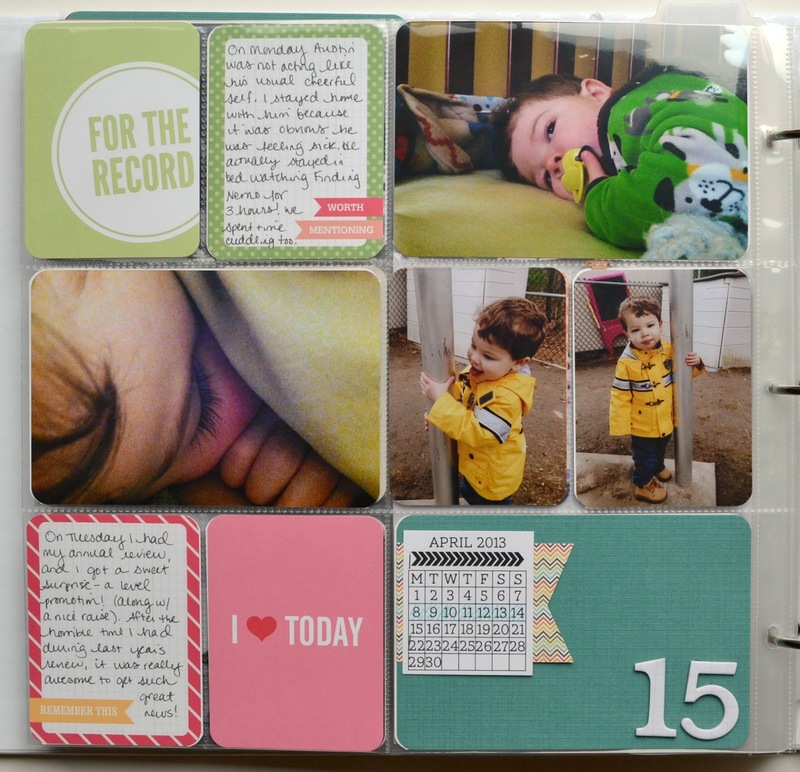 This week I printed digital cards from the Honey, Mayfield, and Seafoam Project Life editions. I found that Honey and Mayfield coordinate beautifully, and I recolored a card from Seafoam to match one of the Mayfield cards. On the left side, I wrote about Austin being sick and a promotion I got at work. 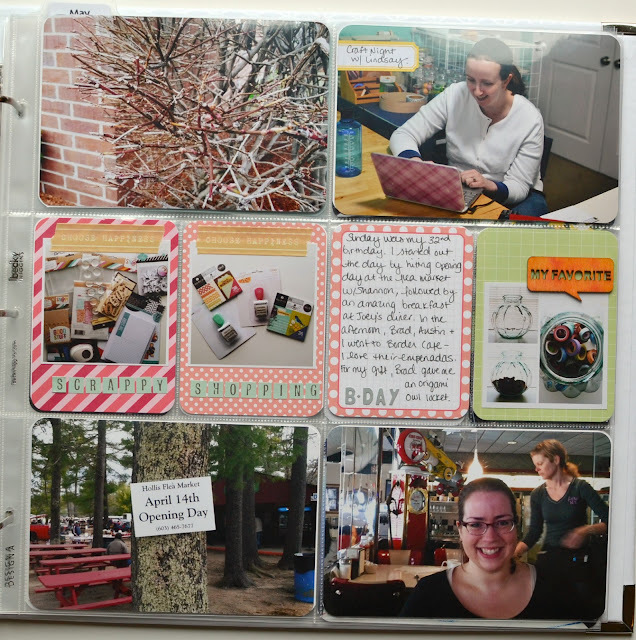 Oh, and I forgot to mention it last week, but that page protector was from Me & My Big Ideas, found at Michaels. They are a little bit wider than the Becky Higgins' page protectors, but I liked the design of this one so I thought I'd pick it up for an occasional change in layout. 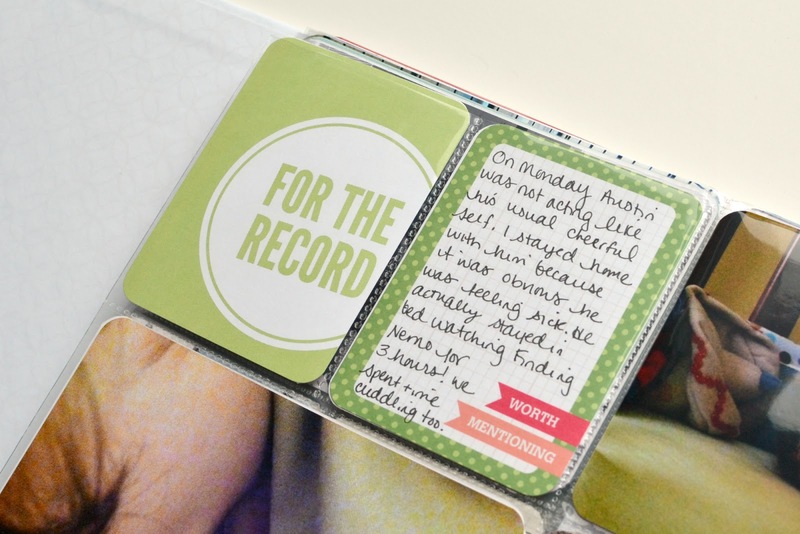 I recolored that Seafoam edition filler card in the top corner to match the green polka dots on that Mayfield journaling card. I love the combination of these two cards to write about when Austin was home sick with a cold on Monday. 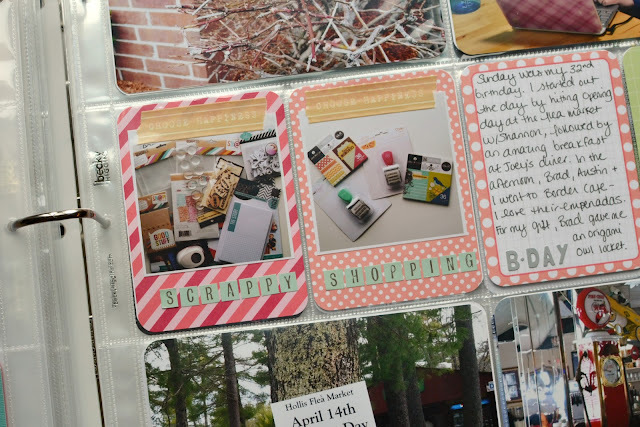 I spent part of Saturday at Michaels and Target looking for some Project Life goodies, and so I added my Instagram shots of my stash, along with some American Crafts Dear Lizzy alpha stickers and some washi from the Studio Calico Project Life add-on kit. It was my birthday on Sunday and I spent the morning at the flea market, followed by a tasty late breakfast with my best friend Shannon. I used a Recollections (Michaels) wood embellishment over a picture of my favorite flea market purchase, an amazing huge glass jar for just $3 for my washi tape. I inked it on one side with Memento Cantaloupe ink and misted using a Stampin' Up! Color Spritzer and a pink Copic marker. I am super happy with this layout. It took a bit longer to pull together but I love how pretty it looks with the pinks and greens. Gorgeous colors! I LOVE it!! It is! Happy belated birthday to you! Another beautiful spread! I really love the colors of the journaling cards. Gorgeous pages - I love the mix of colour and embellishments! Love the green and the pinks , thanks for sharing your pages Melissa.